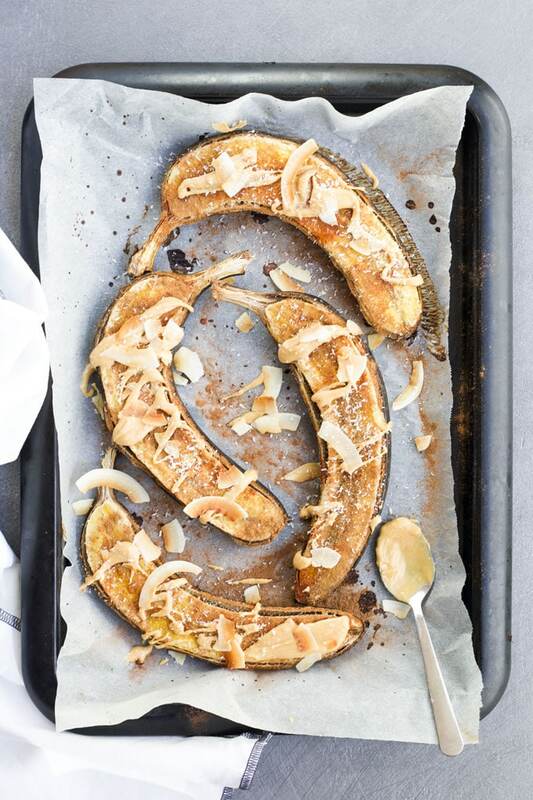 You can’t beat a warm, sweet and gooey baked banana. A perfect dessert for babies, kids and adults. When I was a child, my favourite dessert was fried banana from our local Chinese restaurant. Banana in a delicious batter, deep fried and smothered in syrup. Utter heaven! This baked version is guilt free and can be enjoyed as a healthy snack or even at breakfast. 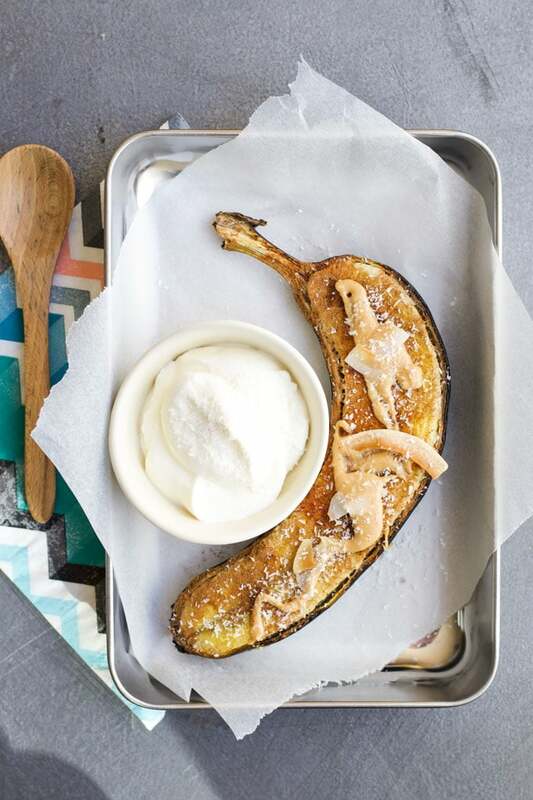 Baking bananas bring out the natural sweetness of the fruit and turns them golden with a soft, gooey texture. They taste amazing all on their own or you can dress them up with a range of toppings and accompaniments. 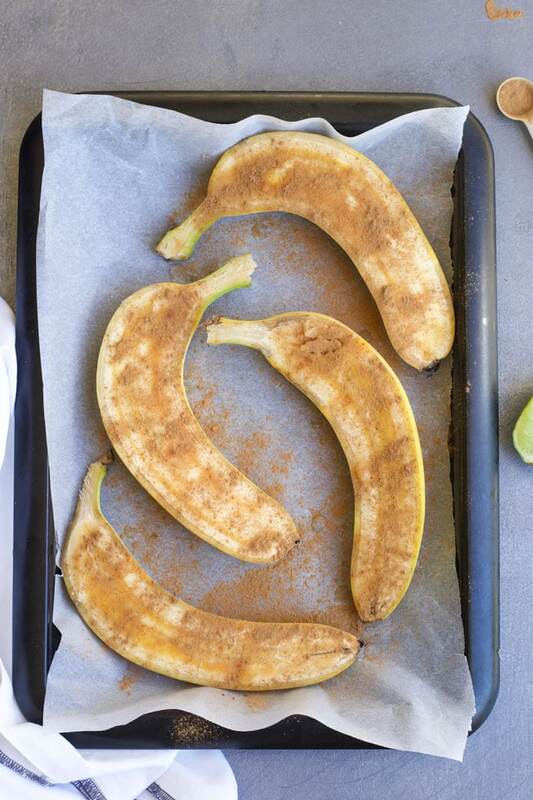 I like to bake bananas will a squeeze of lime juice and a sprinkle of cinnamon. I find the natural sweetness of the banana more than enough and it keeps the dessert healthy. You could try switching the lime juice for orange juice and adding a pinch of cardamom with a drizzle of vanilla. If you are looking for something more indulgent and dessert like, then you can add some honey or maple syrup. This will make the baked banana deliciously caramelised. And one just for the adults…. try adding a tablespoon of rum along with some maple syrup. Delicious! I love to bake bananas in their skin. I think it looks prettier and my kids love to scoop out the soft flesh. Rory, my 3yr old, is at that stage where if his food breaks or is cut in the wrong way then it is the end of the world! The banana skin keeps the banana in one piece and he is in control of eating it the way he wants! If you prefer, you can bake them without the skin. Just peel and half lengthways. Alternatively, you can bake in quarters or bite-size pieces. Bake the bananas for 10 to 15 minutes. This will vary, depending on how ripe your bananas are and how soft you wish them to be. As easy as it is to just peel and mash a banana to give a baby, roasting it can take your banana puree to the next level! 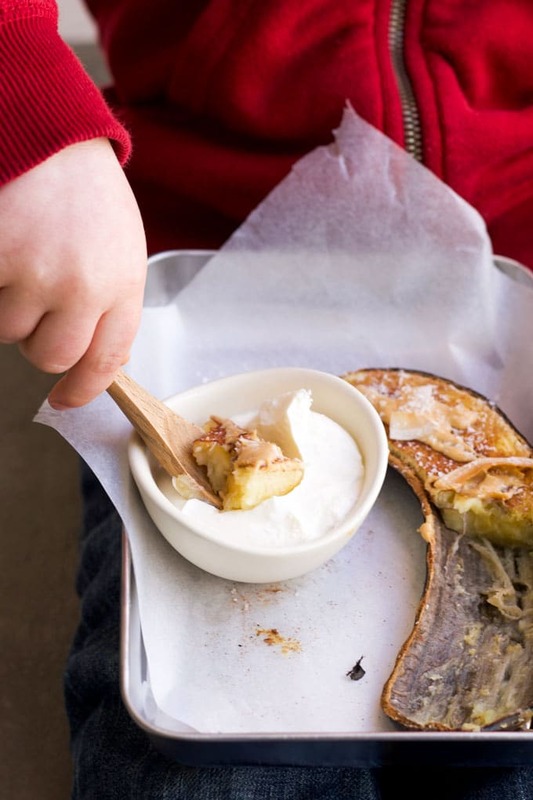 Mash or puree the baked banana and serve it alone, or mixed with other fruits, for an irresistible baby puree. If you are doing baby-led weaning then the baked banana will probably be too soft for your baby to pick up and take to his/her mouth. This may result in frustration and a lot of mess! Instead, your baby may prefer to pick up loaded spoons of the banana. A delicious and healthy dessert for babies, kids and adults. Preheat oven to 200c / 400f and line a baking tray with baking paper or foil. 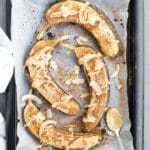 Place the bananas on the prepared baking tray and squeeze the lime juice evenly over the bananas. Sprinkle the cinnamon on top. 1) Leaving the skin on is optional. Feel free to peel it if you prefer. 2) The length of time will vary depending on how ripe your bananas were and how soft you like the end result. Nutritional information is an ESTIMATE only, calculated using an online calculator. Results will vary depending on the size of your banana. The results do not include any additional toppings. Sounds like Hazelnut Spread would be delicious with this, too! Sounds delicious! How was it? Thanks so much, Gia. I hope you enjoy the recipes. My time is limited with the hand photos, I miss those chubby little hands! I’m going to try this tonight – it sounds delicious. However, I think it would have been much more helpful to put the recipe and instructions at the top – I had to scroll down for ages, through information I didn’t really want, in order to get to the actual recipe. Hi Rosie, I hope you enjoyed it :). At the top of each recipe post is a “jump to recipe” button. Press this and you will skip all the extra recipe info and suggestions for adapting.